IT'S the calm after the storm as Irish trainers leave the Cotswolds after what has been one of the most exciting festivals in recent years. The 2018 Cheltenham Festival has put Irish trainers in the spotlight yet again with Bluegrass Horse Feeds' customer Gordon Elliott making huge impact on the turf. At the County Tyrone mill, the Bluegrass team were glued to the finish line all week as Irish champions cleaned up. 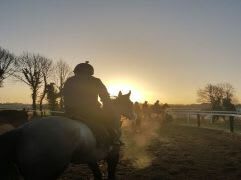 Bluegrass Horse Feeds, the sole suppliers of feed to Gordon Elliott, through Delany Performance Feeds, is Ireland's Kentucky Equine Research Team Member. It also supplies trainers including Gavin Cromwell, Stuart Crawford, Ciaran Murphy and Olly Murphy to name a few. Speaking about Bluegrass Horse Feeds, which is celebrating its 20th anniversary this year, Gordon Elliott said: "I feed my horses Bluegrass Race Horse Cubes and Bluegrass Hi Performance Mix. It's good feed and I am more than happy with it. I have been feeding Bluegrass for over 10 years, and, as results stand, we train Grand National winners and Gold Cup winners. We had six winners at Cheltenham last year and over 200 winners on the track, so, the results speaks for themselves. I couldn't speak highly enough about it." And with eight winners this year at Cheltenham, Bluegrass Horse Feeds is delighted for Gordon Elliott Racing. The company, which is one of Ireland's leading horse feed manufacturers, produces feed which is innovative and scientifically driven to ensure horses are performing at the top level. The company provides feed for performance horses and also horses in a whole range of disciplines. Kenneth Irwin, MD of Bluegrass Horse Feeds, said: "It's been a great week for the Irish in Cheltenham. Trainers, their jockeys and their teams have done a remarkable job and we are proud to be part of their success story. We provide a comprehensive and cutting edge range of feeds for horses in all disciplines. There's something here in the mills for everyone. Our equine nutrition specialists are on hand to give science driven advice and our sales team are doing a great job. "Our congratulations go out to Gordon Elliott. We watched Samcro, Tiger Roll, Veneer of Charm, Shattered Love, Delta Work and Storyteller crossing the line on Wednesday and Thursday. Glenloe did a mighty job at a photofinish. It was superb to watch. On Cheltenham Friday we watched Farclas cross the line in the JCB Triumph Hurdle, Blow by Blow in the Martin Pipe Conditional Jockeys' Handicap Hurdle. "Our congratulations are extended to all trainers who power their horses with Bluegrass Horse Feeds. We have merchants all over the country and we will continue to work hard to make sure our customers have the best feed for their horses' performance. If you have a Cheltenham success story get in contact with us."